It is quite a lovely building, this home of Schocker Paper Company. You could easily imagine it today, converted to apartments, with wide windows overlooking Rock Island’s riverfront from First Avenue. But in 1914, when this postcard was mailed, the riverfront was strictly industrial with little pretense at beauty. Looking through the windows of the building, we see stacked and bundled merchandise, providing a less than aesthetic impression. 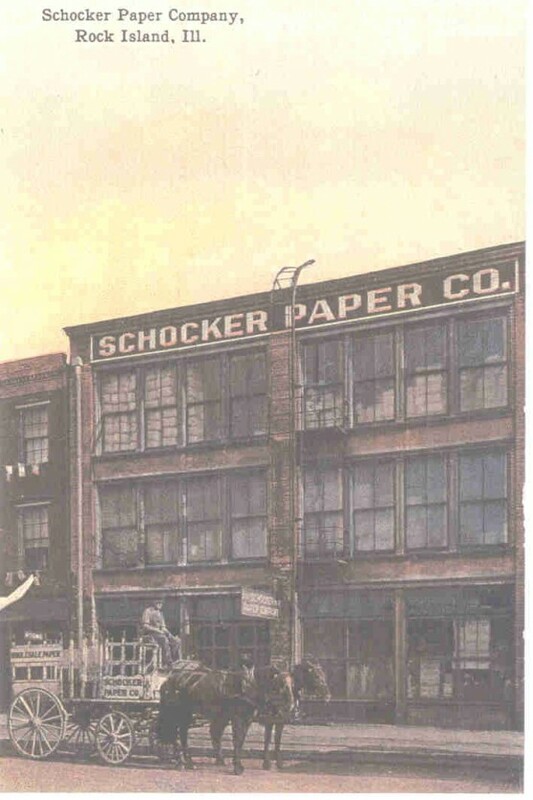 The Schocker Paper Company was founded in 1905 by brothers Louis H. and Henry Schocker, who lived with their widowed mother at 809 21st Street. Their wholesale company, which sold “wrapping paper, bags and cordage,” first occupied a nearby building at 1720 First Avenue, and soon thereafter moved to 1918 First Avenue, the three-story, 40 x 140 foot, building shown on this postcard. It was the former home of the Rock Island Cotton and Mattress Company, owned by the Woltman family and rented to the Schockers. In 1923, Fred Woltman’s widow hired Greenleaf Construction Company for an extensive remodeling and reroofing of the building to accommodate the paper business. The work included removal of two side walls and a rear wall and addition of a concrete floor on the first story. A new office was constructed on the first floor as well. It was claimed that the improvements were of such a nature as to amount to a complete rebuilding. This is probably true, since it was said to be of frame construction, while later Sanborn Fire Insurance Maps show it to be a masonry structure. The Sanborn maps also show a railroad siding extending from the riverfront to the east side of this building, dating from the mattress factory era. This would have been an asset to the paper company as well, facilitating shipment and receipt of large volumes of materials. Amazingly, the construction project took less than two months and didn’t even require a stop in the Schockers’ business. Although this postcard predates the remodeling, the front of the building appears to be brick even then. Cast iron columns between the windows offer the support necessary to permit the extensive window area, ensuring a bright interior, even on this north-facing side. Schocker Paper was in business for sixty years. In the 1931 year-end special addition of the Argus, their ad expressed a simple sentiment: “Out with the old, in with the new. Forget the disappointment of 1931. Let’s enter 1932 full of determination and optimism.” That determination may have carried Schocker Paper through the Great Depression of the 1930s. Although the Schocker brothers retired in the late 1940s, the company continued under new owners until the 1960s when it finally closed. Perhaps the increasing use of plastic for packaging contributed to the demise. Louis died in 1954 and was survived by his brother, Henry, and sister, Elsie. Louis had never married and resided with Elsie at 3517 12th Street for many years. Elsie had been the assistant to Ellen Gale, the first director of the Public Library. When Miss Gale retired, Elsie became our second library director. Henry and his wife had moved to Miami. There are no Schockers in the Rock Island telephone book today. The pictured building has been leveled and the site is now a parking lot. This article by Diane Oestreich is slightly modified from the original, which appeared in the Rock Island Argus and Moline Dispatch on February 9, 2003.